A mother of one and an employee of the Guyana Bank for Trade and Industry lost her life early yesterday morning while on her way to a work-associated activity in the city. The mangled car next to the damaged utility pole Shabana Ali (inset) was driving. Dead is Shabana Ali, 30, a Senior Clerk/Credit Officer and Verification Officer at GBTI Port Mourant, Berbice Branch, and of Lot 7 Ramphal Street, Nigg, Corentyne, Berbice. Brother of the dead woman, Zaman Ali, said that he last spoke to his sister on Friday. “Yesterday I talk to she and she said she going to a training programme in GT.” He stated that after leaving for work yesterday morning on one of his airport trips he received a call stating that his sister met with an accident and died. Reports are that Ali, who left home at approximately 9:00 AM Saturday morning, was on her way to a recreational activity in relation to her job in Georgetown. Upon attempting to make the turn at Seawell Village, minutes away from the Berbice Bridge, she lost control of her Toyota Vitz vehicle bearing license plate number PNN 198. 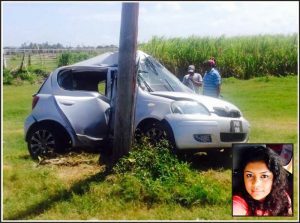 She reportedly slammed into a Guyana Power & Light Utility Pole at the turn before coming to a halt. The pole was split due to the impact of the vehicle. An eyewitness who was not far from the scene rushed over to Ali’s assistance. She was subsequently rushed to the New Amsterdam Hospital where she was pronounced dead on arrival. The Bank employee who was described as a vibrant soul sustained severe head injuries. Her husband Vejay Etwaroo was inconsolable. Shabana Ali leaves to mourn her four year-old daughter, husband, siblings, other relatives and friends.